Schematic diagram of the Au-SiNx waveguide. 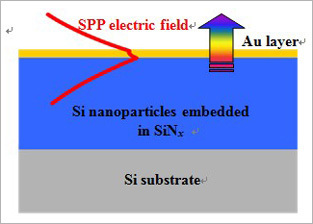 Professor Yidong Huang's group from Tsinghua University, China, has recently reported experimental results of enhanced spontaneous emission (SE) from silicon nanoparticles embedded in silicon nitride, which verified the feasibility of enhancing the silicon light emission with the help of surface plasmon polariton (SPP) propagating on the metal waveguide. It is published in Chinese Optics Letters, Volume 11, 2013 (http://www.osapublishing.org/col/abstract.cfm?uri=col-11-2-022401). For future high-performance processors, the mass data transmission is one of the major technique bottlenecks, and a promising solution is on-chip optical interconnection, which could monolithically integrate both the electronic and photonic devices on a silicon chip. Up to now, silicon-based devices such as modulators, waveguides, and detectors have been successfully realized, but the emission efficiencies of silicon light sources are still as low as 10-5-10-2. Since 2006, Prof. Huang's group has engaged in the research on the plasmonic enhancement for silicon light emission. SPP is an electromagnetic excitation of TM mode propagating along the metal-dielectric interface. Especially, SPP has smaller mode volume than that of optical wave by 1/10 at the resonance frequency with corresponding larger density of state by over 10 times. So, the SE rate could be significantly enhanced by SPP mode. In this work, the researchers prepared amorphous silicon nanoparticles in silicon-rich silicon nitride (SiNx) by plasma enhanced chemical vapor deposition (PECVD) and fabricated a thin gold film of 15-25nm on top of the SiNx layer by magnetron sputtering. With the steady-state photoluminescence, the SPP resonance of the Au-SiNx waveguide was then observed; furthermore, with the time-resolved photoluminescence (TRPL), both of the average SE lifetimes before and after coating gold film were measured, indicating that the SE rate was enhanced about threefold. Instead of measuring photoluminescence intensity, TRPL spectrum is adopted to obtain the SE lifetimes in this work. Because SE rate is inversely proportional to SE lifetime, the SE-rate variation could be directly measured. Despite the enhancement of only ~3, which is still not enough for a practical device, this work verified the possibility of applying plasmonic enhancement on silicon light source. Although the measured enhancement is much lower than the theoretical prediction (>100), according to the latest work of this group, they have found the physical limitations to obtain ultrahigh plasmonic enhancement, which include the propagation loss of SPP mode and the spectral broadening of emission linewidth. Now, they are still working on these subjects to achieve a high-efficiency silicon light source in the future.